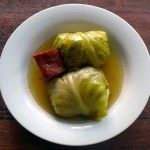 There are recipes shared by so many cultures that they must really have something very special: this is precisely the case of sarma, the Turkish, Albanian, Bosnian, Croatian, Serbian, Slovenian, Macedonian, Bulgarian, Armenian, Romanian, Greek stuffed cabbage or sometimes dolmas. Serbs are true gourmets who love to cook and eat. 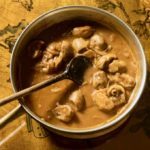 The most conventional wisdom shared by the Serbs is that it is better to eat very well because “the strength passes through the mouth”. 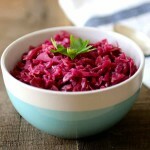 One of the most used ingredients of Serbian cuisine, especially in winter, is sour cabbage, a cabbage in brine, very similar to German sauerkraut and called, in the local language, kiseli kupus. It is obtained by fermenting the cabbage, without any type of vinegar. For the preparation, the whole cabbage is left to rest in a solution of water and salt, under the pressure of a weight, inside barrels of clay preferably, which nowadays replaces the oldest wood barrels. Cabbage is stored in a cool place, at a maximum temperature of 68 F.
It is very important to put enough weight to squeeze the cabbage to prevent it from rising to the surface. Indeed, any ingredient that rises to the surface creates mold when in contact with air. After about a month, you will get a sour cabbage, a source that is very rich in fiber and vitamin C.
The word sarma derives from Turkish sarmak meaning “to roll”. Sarma (in Serbian, the dish is singular) is the king of Serbian cuisine. 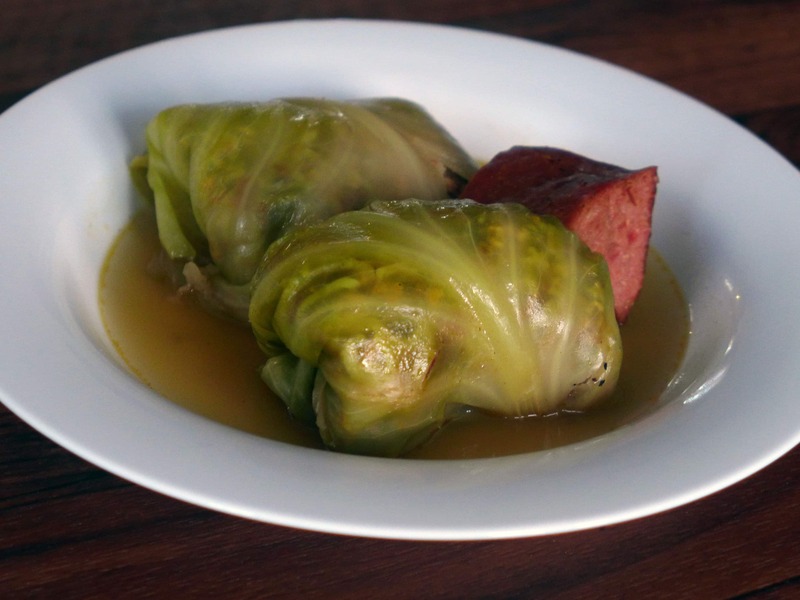 The name is synonymous with sour cabbage: sarma prepared with the brined cabbage is the most popular recipe, but it can also be prepared with vine leaves, or zelje, a plant that bears several names such as rumex patientia, patience dock, garden patience, herb patience, or monk’s rhubarb. Stuffed cabbage is present in Polish, Russian, French, German, Ukrainian, Austrian, Armenian, Azeri, Chilean, Bosnian, Bulgarian, Greek, Chinese, Korean, Croatian, Hungarian, Macedonian, Moldavian, Romanian, Slovak, Jordanian, Lebanese, Syrian, Vietnamese, Iraqi, Turkish, and of course, Serbian cuisine. Sarmale is the name of the stuffed cabbage dish of the Romanian cuisine. 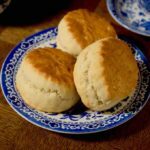 This recipe is traditional for Christmas and New Year’s meals, weddings and baptisms. 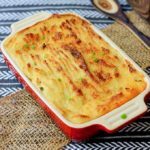 The cabbage is stuffed with minced pork and rice mixed with vegetables, caramelized onions, mushrooms and herbs such as savory or dill. In Croatia, stuffed cabbage is a staple. 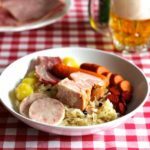 The cabbage is stuffed with smoked and chopped pork, and it is a traditional dish at Christmas. In Russia, it is called goloubtsy (голубцы), and is stuffed with a mixture of pork and rice. The Hungarian version of stuffed cabbage, served on New Year’s Day, is called töltött káposzta. The cabbage, accompanied by fresh cream, is stuffed with minced pork, paprika and ground pepper. In Poland, you can taste golabki. The cabbage is stuffed with beef or pork, onion, tomato, rice and all seasoned with various spices. In Ukraine, stuffed cabbage is called holoubtsi. It is prepared either with fresh cabbage leaves or with brined cabbage leaves stuffed with pork or beef, fish, or rice, buckwheat or even with millet. Kohlroulade is the stuffed cabbage of German and Austrian cuisine. Also known as Kohlrollen, Kohlrouladen or Krautwickel, it is stuffed with mixed minced meat, usually pork and beef. The Egyptians call stuffed cabbage maḥshī kromb or maḥshī koronb (محشي كرمب). No cabbage in brine for this recipe. The leaves are fresh and barely pre-cooked. The stuffing is a mixture of rice, onion, tomato, herbs and spices (usually mint, dill and cumin). The Swedish version of stuffed cabbage is called kåldolmar. 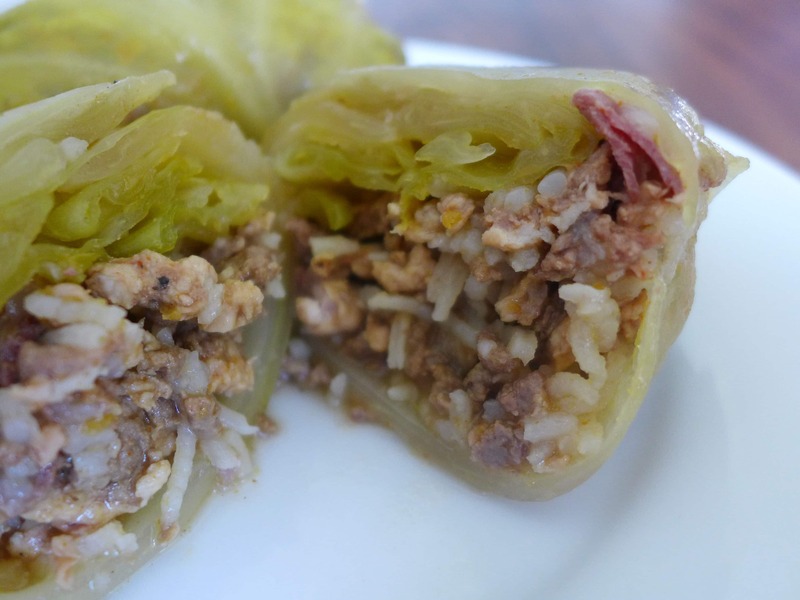 The cabbage leaves are stuffed with minced pork and rice. Kåldolmar are also popular in Denmark and Finland where they are called kaalikääryle. – In Poitou-Charente, stuffed cabbage is slightly different and incorporates Cognac and black pepper. 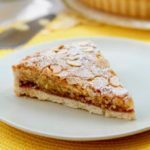 – In Brittany, the bardatte is a cabbage stuffed with rabbit meat or hare, with herbs. And it is served with quails and chestnuts. – In Provence and Languedoc, cabbage is stuffed with meat and is called lou fassum. 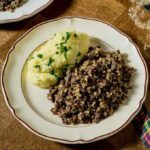 – In the Massif Central, people do things in reversed order, it is the meat that is stuffed with cabbage and this dish is called maôche. In Serbia, Romania, Croatia, Bosnia, Bulgaria, Macedonia, Montenegro, and Ukraine, sarma is a must-have for Christmas Eve meals and Easter meals. Sarma is also the irreplaceable dish for the Eid festival among Bosnian, Albanian and Turkish Muslims. 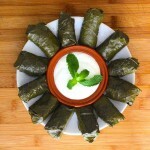 And, in all these countries, sarma is one of the main dishes during wedding ceremonies. This dish was just delicious. 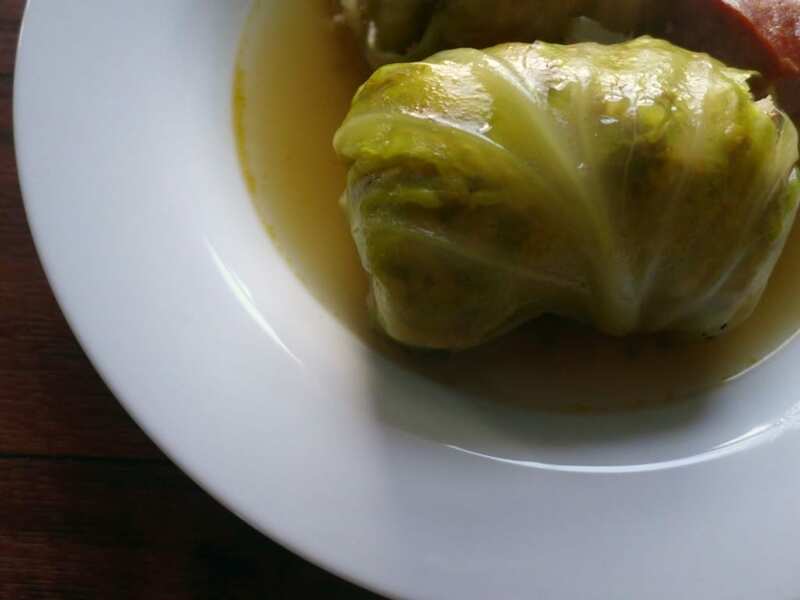 I had never eaten stuffed cabbage rolls using pickled cabbage and I must say that it makes a big difference! 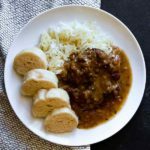 Originally from the former Ottoman Empire, sarmas are cooked in Serbia by using sauerkraut leaves, ground meat, rice and seasonings. Remove the fermented cabbage leaves one by one, being careful to tear them as little as possible. If one or more leaves are torn (especially at first), it does not matter, keep them as they will be used later. The tiny leaves at the end are useful too, so do not throw them away. Wash the leaves, then soak in cold water. This helps the cabbage reject the excess salt and acidity. In a skillet, saute onions, a tablespoon of sweet paprika and add the bacon. When they are nicely browned, add the meat, lots of freshly ground pepper and a little salt. After a few minutes, when the meat is colored, add the rice. Stir well. Remove the stuffing from the heat. Line a cast iron pot with the small cabbage leaves. Add a few pieces of ribs or smoked meat. You will add them between every layer. 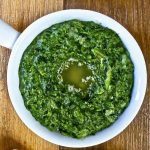 On each cabbage leaf, place one to two tablespoons of filling (depending on the size of the leaf), then roll so as to form a small cushion. Carefully place the stuffed cabbage down in the pan. Operate in the same way with the remaining leaves. After the first layer, put two bay leaves, a few other pieces of meat, sprinkle with a little paprika and continue to place the stuffed cabbage, doing the same thing every subsequent stage. Cover the sarmas with the large torn cabbage leaves that were previously reserved. Cover with water. Cook over medium heat until boiling, then reduce heat to low. 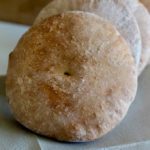 Sarmas get their unique taste with a long cooking time. Simmer at least for 3 hours, or more if you can. Sometimes, sarmas are cooked at least for an entire afternoon or night. Sarmas are cooked when the top leaves become almost transparent. Serve sarmas hot in a deeper dish, with the sauce and bits of dried meat or ribs that were cooked with them. Prepare the brine by mixing hot water with salt in these proportions: 33 grams of salt for 4 cups of water. Rinse a large bowl, ideally clay or glass with boiling water. Place the whole cabbage if possible, or alternatively, if the opening of the container is not large enough, place one leaf at a time, ensuring that they remain intact. Cover with brine. Add the garlic, bay leaves and peppercorns. The brine must completely cover the cabbage. Cabbage tend to rise to the surface, so place a large stone or a wooden or ceramic object at the top that is heavy enough to prevent the ingredients from coming back to the surface and be in contact with the air, creating mildew. Close the container, making sure there is enough air above the brine. Indeed, the fermentation will release gas, so it will need some space to release. Place a towel on the container if the container is transparent (glass) as the preparation should not be in contact with light. Ideally, you should leave at room temperature (70 F). At this temperature, the fermentation will be optimal at 4-5 weeks. If the temperature is lower, the fermentation will take longer. I don’t understand how the cabbage can maintain its texture and chewiness when cooking 3 hours or more. I tried the recipes but after 30 minutes of simmering my cabbage was alreadt translucent and soft but faithfully I keep simmer for 2 hours and the cabbage just dissolved letting all the filling come out, it was that overcooked.. so soft it would pulverize. Any thought? Hey Daniel, sorry to hear. 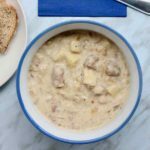 Have you really simmered at very low temperature? Also, have you used fermented or raw cabbage leaves? My mother always pickled cabbage, since we lived many miles from town, and did not have cabbage on hand all the time. She would simmer a head in water, to loosen the leaves, easily, then put them into jars, with Salt, and they would keep in our cold cellar, for any time we needed them to make our Hulupsie, by steaming the leaves, they were more pliable, easy to roll into each other, and fill up the jars better, never had any spoilage, versus doing a whole head.. Thanks a lot for sharing your story, Donna! We have sarmas every New Year’s Day at our house. It is TRADITION! We buy cabbages and core them, then, put them in a large pot with water and bring it to a boil. We then turn it down to low and let the cabbage soften. We pull the leaves off as they get pliable, and put them in a large dish. Our meat mixture in 3 to 1 ground beef to ground pork sausage. We add cooked rice, eggs, onion, salt and pepper to the raw meat mixture then form the mixture in to oblong rounds and roll them in the cabbage leaves. NOTE: We usually cut off that hard piece of cabbage core from each leaf. In another large pot, we use the outside leave and inner leaves of the softened cabbage to line the bottom of the pot and add sauerkraut (we use store bought). We then put in a “layer” of cabbage rolls and repeat additional layers with the cabbage and sauerkraut in between each. Once completed, we put in just enough water to cover the sarmas and bring to a boil. Then we turn it down to low, put a lid on and let is cook for HOURS. So delicious with mashed potatoes and green beans. Thanks a lot for sharing your recipe, Susan. Happy New Year!